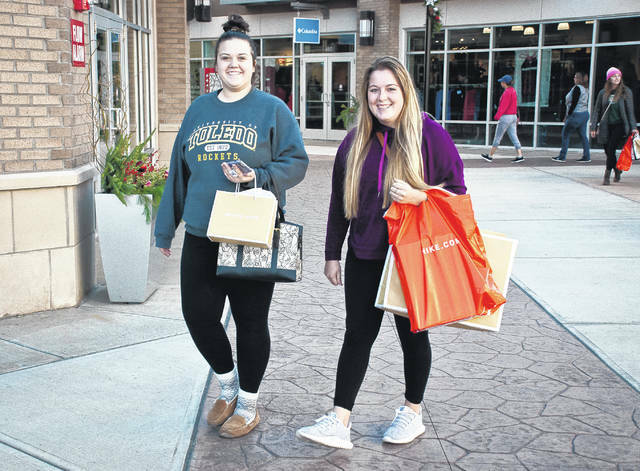 Looking for the deals of the day, Amy Poorman, left, and Madison Myers walk the Tanger Outlet Mall early Friday morning. The two said they started Thanksgiving evening, took a break for some sleep, and started back out Friday morning. Staying up all night for Tanger Outlet Mall’s Moonlight Madness After Thanksgiving Sale, General Manager Carl Landis said more shoppers visited the mall this year than in 2016. He said it began to slow down between 2 and 3 a.m. Friday morning, but started to pick up again by 6 a.m.
Landis said as long as he was moving he was fine, but when he was sitting at his desk working on a report, he started to nod off. Tanger Outlet opened at 6 p.m. Thanksgiving night and remained open until 10 p.m. Friday. Landis said there are a couple of new stores in the mall this year, but for the most part, all the others have been with the mall since the beginning. He said Subway is opening a new store in December. “It’ll be nice to have another restaurant,” he said. Landis said the mall was able to utilize the Harley Davidson store’s parking lot for overflow since it was closed Thanksgiving Day. He said the lot filled quickly and stayed full most of the night. According to a couple of Book Warehouse employees, store manager Sal Nigro is the “greatest boss ever” because he stayed up all night running the store by himself. When The Gazette had caught up with Nigro, the assistant manager had to wake him because he had laid down for a much-needed nap. Nigro said business was steady all night with his biggest sales coming in between 3 and 4 a.m. Last year was the store’s first year in the mall. Nigro said he wouldn’t know how much more sales were up over last year until the close of business Friday night. By 9 a.m. Friday morning, the mall parking lot was filling up again and shoppers were flooding in looking for deals. With her arms loaded down with shopping bags, Madison Myer of Marion window-shopped the stores for the best possible deals with her friend Amy Poorman, also from Marion. Women weren’t the only ones out searching for deals. In a group of five gentlemen, all of them carrying bags from various stores, Alfonso Leon said they, too, had found several “very nice sales” they had taken advantage of Friday morning. This entry was tagged Black Friday, Book Warehouse, shopping, Tanger Outlet Mall. Bookmark the permalink.